New from John Wiley & Sons, Inc.
Computer programming legend and author of the highly acclaimed book Code: The Hidden History of Computer Hardware and Software takes readers on a journey through one of the seminal papers in the history of computing. Anyone who has explored the history, technology, or theory of computers has likely encountered the concept of the Turing Machine. The Turing Machine is an imaginary — not even quite hypothetical — computer invented in 1936 by English mathematician Alan Turing (1912–1954) to help solve a question in mathematical logic. As a byproduct, Turing also founded the field of computability theory — the study of the abilities and limitations of digital computers. Although the concept of the Turing Machine is well known, Turing’s original 1936 paper is only rarely read. That’s too bad, because the paper is not only a fascinating read but a milestone in the history of computing and 20th century intellectual thought in general. This book presents Turing’s original 36-page paper (and a follow-up 3-page correction) with background chapters and extensive annotations. Mathematical papers like Turing’s are often terse and cryptic. This book explains many of Turing’s statements, clarifies his discussions, and provides numerous examples. Interwoven into the narrative are the highlights of Turing’s own life: his years at Cambridge and Princeton, his secret work in cryptanalysis during World War II, his involvement in seminal computer projects, his speculations about artificial intelligence, his arrest and prosecution for the crime of “gross indecency,” and his early death by apparent suicide at the age of 41. Parts I and II together cover the first 60% of Turing’s paper, encompassing the Turing Machine and computability topics. Part III is a fast paced look at the remainder of Turing’s paper, which involves the implications for mathematical logic. Part IV shows how the Turing Machine has become a vital tool in understanding the workings of human consciousness and the mechanisms of the universe. The Annotated Turing is an important addition to any Computer Science curriculum. It can be used in the study of the Theory of Computation, History of Computing, Computability, Theoretical Computer Science, and mathematical topics relevant to computer science. Now available at bookstores everywhere! Academics click here for more information. Petzold will be a stalwart companion to any reader who undertakes to read Turing's classic with his aid. 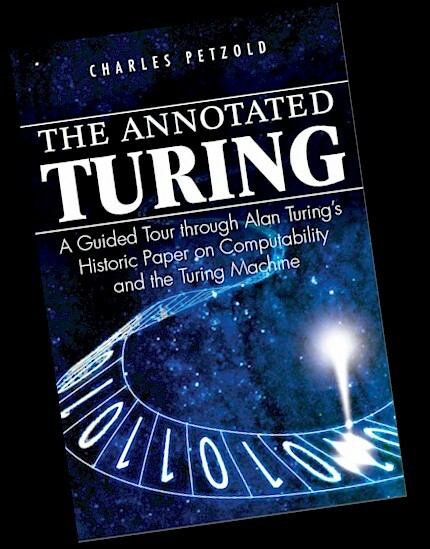 The Annotated Turing will also be quite enjoyable to a more casual reader who chooses to dip into various parts of the text..
One could browse this book and get a good survey of computability and Turing’s work, including stories about Turing and other contributors. To those willing to read carefully, Petzold provides a fabulous resource for one of the great milestones of computing. Mark: What's great about the book is you don't have to be a mathematician to read and understand what you’re writing about. That's what really impressed me. You've done a marvelous job of making it accessible to the lay person. Carl: I felt the same way reading "Code." It's Just a good read. Carl: It's a fascinating book about a fascinating man. Mark: You don't have to be a math geek to enjoy Charles's book. Mark: It's consumable by anybody who's interested in Turing and machines and logic. It's great. "Petzold's Annotated Turing is a gripping testament to the amazing mind of Alan Turing. Writing the book was a nine year labor of love, and it shows. It may be his shortest book -- but it could also be his best yet. "Some books entertain, some inform; some confirm what you already knew, some make you change your mind about something. But then there are some books that just make you think "wow! I wish I'd written that". For me, Charles Petzold's The Annotated Turing falls into that last category. It's a book worth reading not only for the topic itself but the way it's presented." "It's the kind of book that ten or twenty years from now will still be totally, totally relevant." "I highly enjoyed this book and would strongly recommend it to any programmer, mathematician, or person with an interest for numbers. Much of The Annotated Turing is true to the title; Petzold presents the unmodified original Turing paper and provides annotations to help understand the material, while also citing related material and events. In this capacity, Petzold is unsurpassed.... Petzold's greatest contributing to Turing's work comes at the end however, when he explores the impact Turing had on the fields of mathematics, computer science, and philosophy." "Even with a good professor and a decent textbook, Turing's computability paper was tough going. The good news for us in 2008 is that Charles Petzold's book The Annotated Turing, which covers Turing's paper and much of the background material needed to understand it, is more than decent: it does at least as good a job of explaining the material as I remember getting from my course in Mathematical Logic...."
"Pre-ordered: The Annotated Turing. Alan Turing generally hits a broader audience, but his computability paper? And a book walking you through the same? Right on the money. Computer geekery? Check. Math geekery? Check. Written by Charles Petzold? Check. Looking forward to that email in May - 'Your Amazon.com order has shipped.' "
"I am very excited for you. You are inspiring me to return my attention to some related topics that I have wanted to explore and popularize for a long time. I can't sit still about this. I placed my order. I'm eager to have the book and follow Petzold's narrative through Turing's paper." "I'm looking forward to your Turing book! It is always fascinating (at least to me) to catch a glimpse of the vast implications of the mathematical abstractions underlying our modern world. That a simple idea like the Universal Turing Machine could hold the key to computability is a wonderful tribute to the human mind's capacity for abstract thought. It also doesn't hurt to author a book with wider appeal than the now fallen from favor technical genre. I hope it does well and affords you many years of similar work." "Wow! Thank you for writing this book! I can hardly wait to read it because your skill as story-teller is first rate. I loved Code! I revere my copy. Reading it unlocked something in me and has given me such a feeling of confidence that I believe there isn't anything I can't do. It was a wonderful experience when the concepts 'clicked.' And because of that I am eagerly looking forward to reading The Annotated Turing! Thanks again!" "Book radar: The Annotated Turing. This looks like it might be fun. I've enjoyed Charles' non Windows specific computer science writing in the past so the prospect of classic subject matter and good writing bodes well." "And now comes news of the spiritual successor to Code: The Annotated Turing. Here Petzold will work his way through Alan Turing's paper on computability that launched modern computer science. Turing lived a short, fascinating, tragic life and Amazon's summary says the book will also explore this background. While understanding Turing's work isn't necessary for modern software developers that churn out production code, it is for anyone who wants a full classical education in computers and technology. Based on Code, I'm really looking forward to what Petzold can do with this."